Maddox isn’t so much a restaurant as an institution. You can get married here (in the “Goble Lodge”), have family reunions here—hell, you could probably have a funeral here. 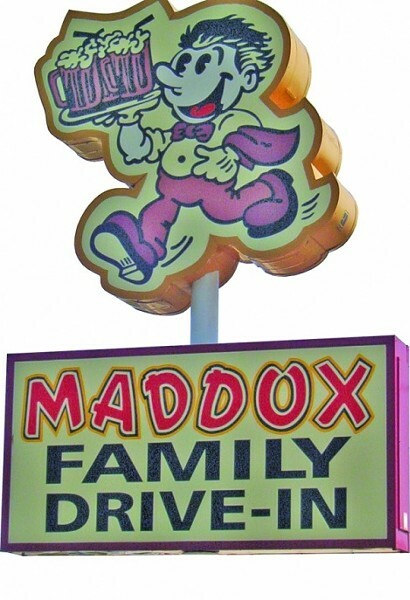 The first time we pulled up to the Maddox Family Drive-In last summer was at 11 in the morning. Even though the restaurant doesn’t open until 11:30, the drive-in was already lined with cars. Irv Maddox opened the eatery during World War II as a lunch counter with seven stools. After a few years, he moved the restaurant into a log cabin up the street and expanded to serve dinner. The original log cabin is part of the Maddox Ranch House Restaurant, south of the drive-in, where you can choose from $35 filet mignon and chicken-fried bison steak in an atmosphere reminiscent of a retirement home filled with fake flowers and screaming children. The drive-in, however, is straight-up nostalgia—1950s décor and ponytailed waitresses with armloads of burgers and shakes. Cozied up at the Maddox Drive-In in my truck, I’m looking at pictures of dancing hot dogs. Behind us, a sign on the drive-in wall proclaims, “Over 4,000 head of choice beef used annually!” The choice beef is out back. A teenager in tight jeans and a sweatshirt braves the wind to take our order, and asks us to flip our headlights on if we need anything. We don’t. On our laps and on the plastic trays hanging from our car windows are baskets of fat golden fries, a bison burger, fried chicken, cornbread (in the shape of an ear of corn), a roll with raspberry honey butter, mashed potatoes and gravy, a house-made cherry pie and a mint chocolate chip malt—all for under $20. My companion practically moans as he bites into his burger. Juice, not grease, runs down my chicken-spattered chin.